new Activity for comments with style and declaration in AndroidManifest.xml file. And the last thing, let’s handle onClick on bottom part of feed item which should open CommentsActivity for current photo. For now we use whole bottom part of mocked view, but in close future we’ll replace this with real buttons. 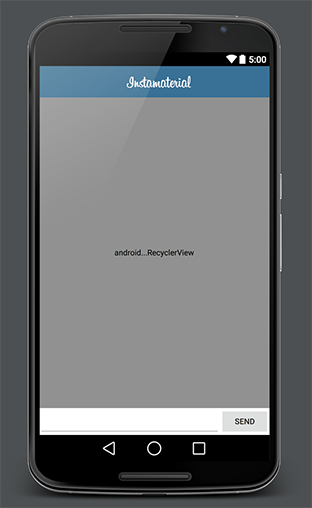 In this step we have to add onClick listener in RecyclerView adapter. This listener will be set on bottom view in every single item presented in list. Also we’ll create simple interface for integrating MainActivity with our adapter. How is it look in practice? In case we missed something, here is full commit with onClick on item in RecyclerView adapter. …and that’s all for initial config. Comments items should be displayed one after another, right after expand animation will finish. By calling overridePendingTransition(0, 0); we disable exit animation (for MainActivity) and enter animation (for CommentsActivity). 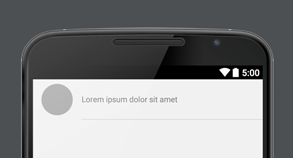 Next, in CommentsActivity implement expand animation for background. For this we can use simple Scale animation (we don’t have any visible content in that moment, so no one will know that we are stretching background instead of expanding it 😉). Don’t forget to use setPivotY() method for setting the right initial position. As it’s showed above our animation will be started once, after we open CommentsActivity. Thanks onPreDrawListeneranimation will be performed at the moment when all views in the tree have been measured and given a frame, but drawing operation hasn’t started yet. Still something is missing, right? Every item’s animation should be delayed a little. Otherwise all animations will be performed at the same time and user will see “one” animation for whole content instead of animations for every single item. Adapter should have possibillity to lock animation, because we don’t wont to animate items while user is scrolling content. For displaying avatars we use Picasso library with CircleTransformation. Thanks RecyclerView and his adapter we can use notifyItemInserted() method (line 80) which performs default animation for newly inserted item. The rest of code is pretty simple. Items animations are blocked when user starts dragging RecyclerView (they are temporarily unlocked when the user adds a new entry). And that’s all. Enter transition for CommentsActivity is finished. And that’s all! We’ve just finished second step of InstaMaterial concept implementation. In next post I want to focus on details which we currently missed.